Many shed searchers have aspirations of constructing one of the most recent entrants of large plastic garden sheds exhibiting pure stylish looks whilst trumpeting out their weather-resistant & low-maintenance advantage however most of us have concerns regarding how the heck these spacious constructions are going to remain clamped to the ground, after-all they are going to be accommodating one huge amount of storage. French company Grosfillex are becoming renowned in Europe for their quality summerhouse constructions, with designs incorporating structures wrapped in weatherproof PVC resin they eliminate future’s conservation issues. Grosfillex designs incorporate a sturdy steel infrastructure delivering overall rigidity, a highly impressive anchorage system that secures the steel framework down into the foundations whilst security-wise, a key lockable handle surpasses most competitors padlock designs. 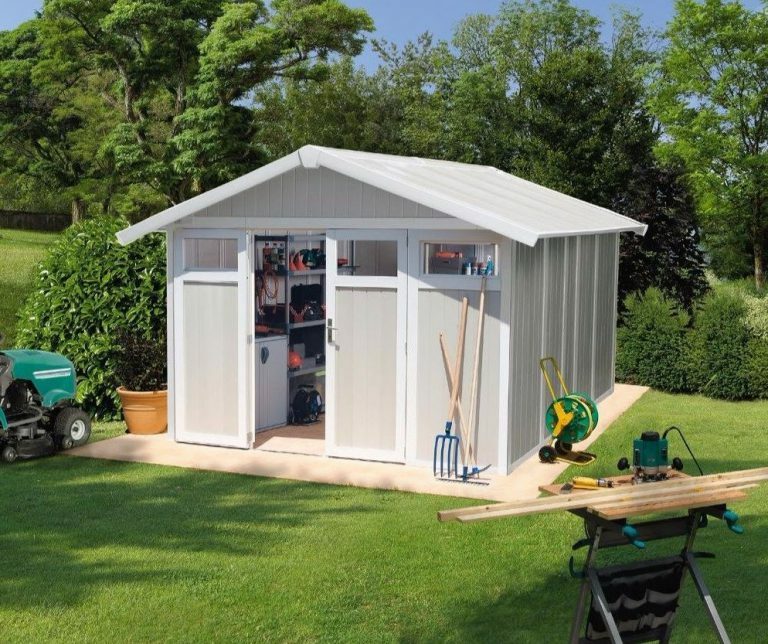 Grosfillex’s largest 11 m² Utility Sheds boast approximate 10 x 11 ft dimensions, generating an effortless garage clear-out whilst delivering a whole range of garden services. With intentions to complement any garden’s outdoor scenery, their weatherproof composition and sturdy construction hides behind the wondrous display of ultra stylish looks exhibiting summery pastel shades. Four sizes complete Grosfillex’s Utility range, starting from the smallest 2.76 m² Utility Shed displaying the most idyllic of appearances, leading up the ranks to 4.9 m² and 7.5 m² sizes. Images accompanied by links to their in-depth reviews are presented near the end of this post. 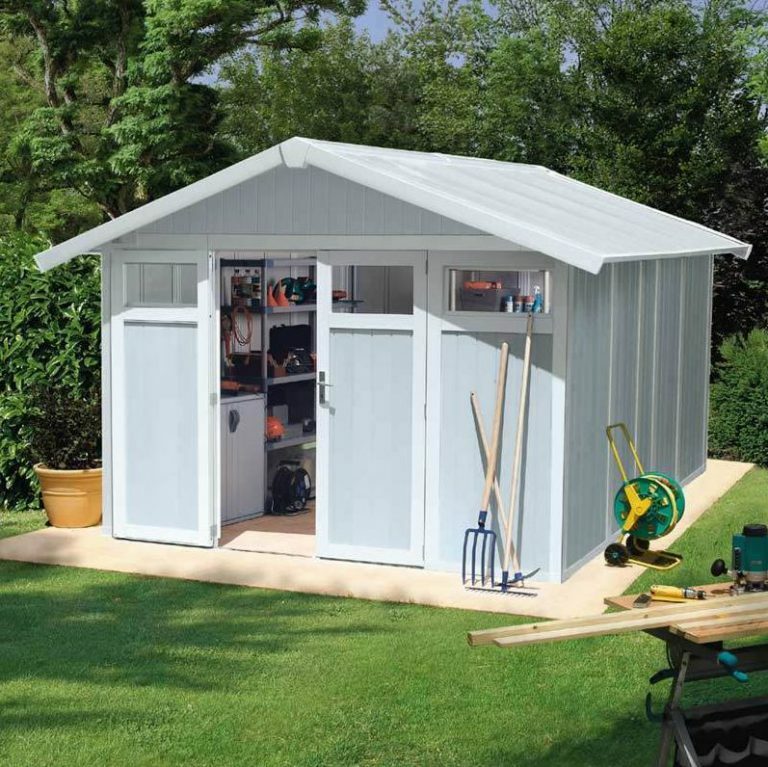 Shed Ranges displays competing low-maintenance resin sheds. 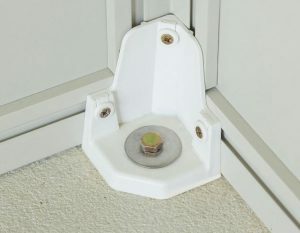 Absent from a Built-In Floor – Worried? Grosfillex’s absence from a built-in floor derives from their summerhouse design, purposely intended for the purchaser to fit a type of flooring conditional to their garden room’s services. For instance, non-slip floor tiles provide the advantage situated in a kitchen diner, swimming pool chalet, Jacuzzi bath hut, etc whilst the various shades of polished wooden flooring complements any office space, a she-shed’s outdoor garden room, man-caves escape route or kids gaming den etc. Grosfillex’s superior summerhouse construction combined with their anchorage system delivers superior reinforcements, why alter something that clearly works by integrating a floor for utility services. Apart from larger windows in the summerhouse doors and facade to deliver oceans of daylight, their Utility design is pretty much identical with the exception of smaller windows accomplishing more privacy for storage accommodation. Like every resin shed, the preparation of solid level foundations in either wood or concrete regard the essential one step process to ensure their perfect construction. For utility services concrete or wood decking left as laid provide ideal foundations. The key is making sure the solid foundations are level as this delivers a straightforward assembly. The PVC panels plumb alignment is derived from level footings, the doors operate flawlessly plus the future scenario of a slanted shed is averted due to the roof weight applying equal force on all shed sides thus counteracting against future leaning pressures. 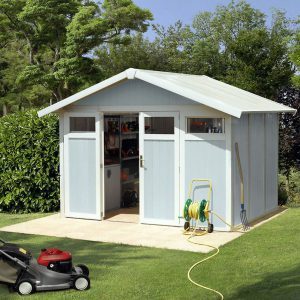 A solid base is imperative for the accommodation of hefty storage and the rolling in of weighty lawnmowers however it’s pivotal for a shed this size to be properly clamped down onto the solid substrate below to enhance overall stability and increased resistance to survive the storms . Anchorage is where Grosfillex sheds surpass many of their competitors systems regarding their integrated resin floors being clamped down onto the foundations. Due to Grosfillex sheds absence from a built-in floor paves the way for securing the steel infrastructure down onto the solid substrate below instead of a resin material, delivering their sheds with mightily strong wind resistance levels. Once the shed is assembled Grosfillex demonstrate how to fully waterproof the shed by running a bead of sealant along the internal side of the base perimeter’s steel framework. The PVC panels making up Grosfillex sheds are secured around the shed’s steel infrastructure represented in the images by white vertical struts. These struts secure to the horizontal metal framework up above adjoining the roof and down below they secure to the shed’s bedrock metal structure that runs around the base perimeter. The steel framework delivering the sheds bedrock base is where Grosfillex anchorage system takes place. At certain points running around the base perimeter framework, clamps are screwed into the framework whilst anchor bolts simultaneously screw down into the foundations below. Secured to the four steel corner posts of the shed regard triangular anchor clamps that secure to both corner angles of the base metal framework and screw down into the solid substrate below with anchor bolts delivering stability from a very thorough reinforced anchorage system however Grosfillex have also designed an additional anchorage kit for those exposed to unsheltered areas. The anchor kit contains a series of steel wires that inconspicuously install into the corners of the shed with a straightforward assembly procedure. The wires adjoin all for corners of the shed together where quick links, tensioners and clamps enhance the already in place anchorage system down onto the foundations below whilst bolstering the shed’s perpendicular stance with rigidity. This anchorage system receives superb feedback delivering sturdiness to Grosfillex’s overall construction. Many times the additional anchor kit is inclusive with the shed, check with the supplier prior to purchase. 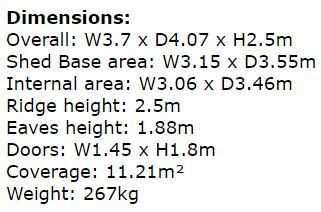 A sturdy well strapped topping is pivotal for 11 m² dimensions. Grosfillex accomplish this by incorporating a centred steel beam running the full length within the apex roof-ridge to which all the roof infrastructure secures to, enabling a roof capable of holding heavy snowfall combined with rigidity to survive the storms. Normally, the most common sight seen on competing quality plastic sheds regarding reinforced roof support relates to a steel truss system stretching out across the internal rafters whilst their full length translucent skylight strip embedded within the roof delivers daylight to the interior. Grosfillex accomplish a more homely summerhouse design with their cleverly devised roof fortification by generating a spacious expanse of internal ceiling height whilst daylight is entered via the front windows for their utility sheds. Summerhouses incorporate larger windows in the doors plus additional windows in the facade generating an abundance of daylight, beneficial for living accommodation and garden rooms etc. Designed with a 20° angled apex roof pitch generates an immediate rainfall drainage system on top whist benefiting the interior with adequate ceiling height for an adult to comfortably wander around inside without that bent-over or cramped-in type of feeling. These roof panels are thick twin-sided PVC sheets adjoined together by a reinforced resin structure, resistant to decay when damp conditions attack they are immune from weather deterioration and impermeable to rainwater, replacing roofing felt’s sudden structural demise with polypropylene, a material that doesn’t succumb to decay and never requires re-roofing. A PVC composition of polypropylene resin manufactured into double-skinned sheets reinforced by an internal ribbed formation regards Grosfillex’s design. 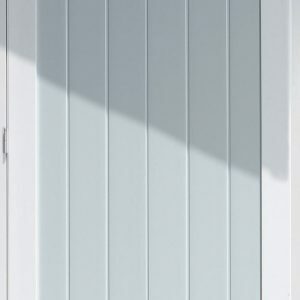 The walls outer-skin is molded to display attractive panelling whilst a heliographic printer embosses delightful summery pastel shades of light blues and greens resulting in Grosfillex’s 26 mm thick facade panels. Polypropylene resin provides the weatherproof and impermeability advantages without being susceptible to deterioration through decay and rot when exposed to rain & winter’s climates whist UV protection stabilises their manufacture to avert the occurrence of surface-cracking and a discolouration-effect materialising whilst under attack from sunburn rays, the deep-rooted problem unprotected plastic succumbs to in hot climates. Why choose a Grosfillex designed shed? Grosfillex provide their answer! The entire design regarding Grosfillex’s resin manufacture is produced from 99% recyclable thermoplastics, trumpeting out environmentally green credentials whilst their surface supersedes traditional conservation duties associated with re-varnishing and rotting structure replacements with a quickie spray-hose down. Cleaning our shed only takes a few minutes, a whirlwind light pressure-hose down rejuvenates the sparkling appearance in rapid time, a job I generally do on a summer’s evening whilst watering the plants. Ingrained dirt soon disappears when scrubbed with a soft brush, this prevents marking the facade. Warm water mixed with light detergent followed by a light spray-hose down describes resin’s elementary cleaning role, white vinegar mixed with warm water works fab too. Grosfillex have really gone to town to eradicate any notion of a sweaty atmosphere developing & condensation accumulating on the inside by generating a fresh-air current to the interior, delivered through the installation of 6 air-vents front and back, one in each of the four corners and two within the apex peaks. 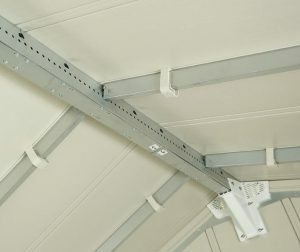 Although the majority install quick-fit stand-alone shelving to utilise the shed’s internal height in accommodating weighty storage, mounting kits enable the installation of shelving plus they deliver a solution to hanging long handled gardening tools against PVC walls – great piece of kit. Wall mounting kits are many times inclusive with the shed’s purchase (check with supplier). The wall-mounts are designed with a conformation that slots within the shed’s steel framework and secure with screws. These kits allow screwing into enabling customising the interior to your satisfaction. On the frontage regards four windows, two installed into the side panels and one in each door to illuminate the interior with daylight whilst accomplishing utility privacy. Double doors deliver their wide entrance accompanied with quality metal hardware to ensure first-class access whilst a key lockable handle supersedes the security measures of padlock designs. 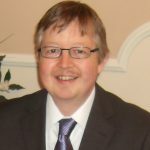 Feedback praises Grosfillex’s security. Constructing this 11 m² Utility shed will take two people at least a day, maybe two to complete due to the sheer size however assembly is made straightforward if the correct foundation stipulations are adhered to. Level foundations are pivotal as they simplify the plumb alignment of the facade panels, as explained above. Assembly requires following the sequence of steps illustrated in the instructions, implementing the procedure with common household tools. Refrain from building in a tight spot as movement around the shed’s perimeter is necessary to erect a step ladder to accomplish securing the roof panels. Shed Sizes provides images of competing quality plastic sheds with links to their in-depth reviews stepped up in order of size. 11 m² dimensions provide spacious accommodation for utility services whilst Grosfillex’s ultra-modern design encases the facility in weather-resistant PVC resin resisting future decay. Exhibiting pastel shades of summery tones their delectable appearance blends gracefully into any garden’s landscape. A sturdy construction, secured into their foundations with enhanced anchorage delivers rigid stability, quality double-doors deliver superior access & security with the operation of a key-lockable handle whilst their spacious more homely internal ceiling expanse derived from the robust steep apex designed roof generates an effective rainwater drainage system on top. A straightforward assembly, 10 years limited Grosfillex warranty and superb feedback received provides confidence and the reasons for their gaining popularity. Thanks for reading Grosfillex’s 11 m² large plastic garden sheds review. 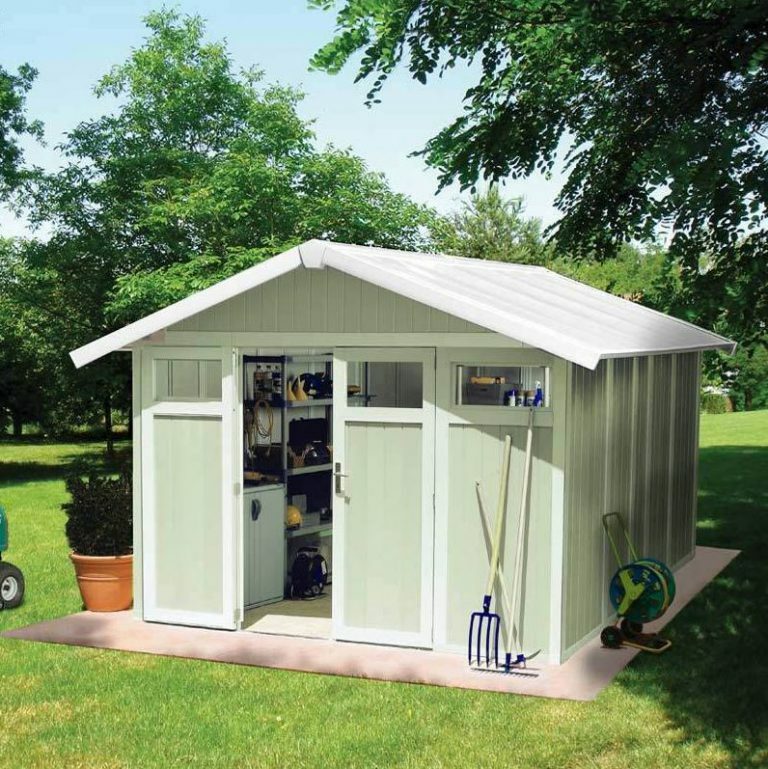 If you have any related PVC utility shed questions, please ask in the comment section below. Always happy to help. Simon, I love all your posts about sheds. I know I need to get one, but I have to get to the point where I have a spot for it. Looks like having a concrete foundation poured would be my first thing I need to do right? I am almost ready for that as I do NEED to get my back yard squared away, as it is a mess. I really like this shed in particular. Looks durable and long lasting. Thanks for dropping by and reading about Grosfillex’s large plastic garden sheds. The only real stipulation regarding any resin shed is to have a base of solid level foundations for the shed to sit on. This one step preparation process alleviates a plethora of potential frustrations during assembly and further down the line, so it’s worth adhering to. General consensus regards wood is perfect up to a certain size – roughly 8 x 10 ft however for a larger shed plus whether intentions are for driving in on a sit-on-mower and to survive heavy duty demanding storage pressures, solid level foundations of concrete laid at least 10 cm thick provide the perfect substrate to cope with the stresses whilst providing solidity for firm anchored groundings. 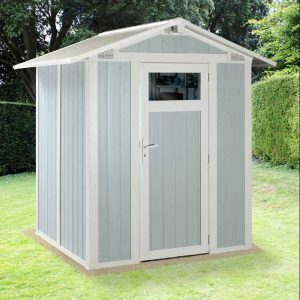 All sheds do vary, Lifetimes boast they are the best, Oaklands and Fusion sheds are the new age sheds receiving superb feedback, will Factor sheds ever be beaten on price compared with quality? Suncast trumpet out their benefits, the list goes on however the anchorage system and the security advantages Grosfillex offer will take some beating and they do receive outstanding reviews. Hi, Simon! I just wanted to let you know that I love your site so much! As an avid gardener and outdoor enthusiast, I would be thrilled to come across your site if I was looking for a pre-fab shed or storage box. Your use of images and level of detail and comparison in your reviews of these sheds is truly superb, as well as your high level of writing. Thank you for taking the time to build this informational and engaging site. 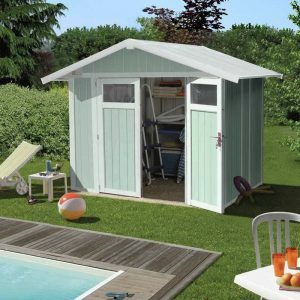 Thanks for dropping by to read about Grosfillex’s large plastic garden sheds. Thanks for your kind words. We too, like you spend a lot of our spare time gardening, sitting outdoors and alfresco dining when we’re fortunate enough to receive good weather, we certainly make the most of the warm weather when it comes our way. A few years ago when our wooden shed rotted away, we searched for an alternative solution to being held ransom to conserving and maintaining duties and opted for a resin style which has turned out just as described for us, low-maintenance and so easy to clean. We’ve since purchased a resin style deck box etc, to escape the yearly frustrations regarding upkeep work. Over here in the UK, warm weather days are rather infrequent, this low-maintenance resin composition provides the time to spend enjoying the weather. This is where the idea of setting this website up was born, to introduce the new styles of resin garden sheds, horizontal sheds and deck boxes to visitors wishing for a low-maintenance future too.